In the late 90s, atheists began making the argument that less than a majority of scientists believe in God. In addition to this they argued that the National Academy of Sciences had only about 5% members who believed in God. All of this was due to the publication of a 1998 article entitled "Leading Scientists Still reject God." In that article, the author got hold of a survey done in 1914 by a guy named James Henry Luba and Nature Magazine noticed that the stats had not changed. So the conclusion that scientists are such great priests of knowledge, if they don't believe in God there must not be one. Atheists made the most of this since Luba echoed the fallacious conclusions they themselves drew from the data. "Leuba attributed the higher level of disbelief and doubt among "greater" scientists to their "superior knowledge, understanding, and experience" (ibid). Of course this is fallacious, scientists don't have any special knowledge that would tell them God doesn't exist or that he does. It was Nature that polled the NAS. One of the things that I argued at the time was that the questions were rigged to slant the discussion toward the fundamentalist concept of God portrayed in a literal understanding of the Bible. I argued that if you factored in a more liberal concept of God belief among scientists would go way up. That contradicts the findings of nature which had most unbelief in hard sciences (physics and biology) and more belief in 'soft' or social sciences. Elaine Ecklund, and Christopher Scheitle" questioned 2,198 faculty members in the disciplines of physics, chemistry, biology, sociology, economics, political science, and psychology from 21 elite U.S. research universities.4 Overall, 75% of professors contacted completed the survey." Euklund and associates also found that in a sample of 21 major universities only 15% of scientists found that science and religion were always at odds. Euklund's findings show that factors which lead scientists to be unbelieving are not usually related to science but to personal aspects of their lives, such as being emigrants, or being raised in atheist households. It's a cultural thing. Think about it, if a kid is bright he wants to excel in the things to which he is exposed, he going to be more likely to go into a religious vacation if he's exposed to religion and less likely if he's form an unbelieving background. The odds are a bright kid will go into science rather than business if his temperament doesn't lead him/her into liberal arts. A surprising finding is that medical doctors tend to be very religious. In the general popularization belief my decline with increases in education but this is not so among the most educated. Professors across the board (all subjects) reflect belief in God similar to that of the General Population. My own explanation is that people who get degrees and go into non-acadmeic jobs know just enough to be dangerous, they don't continue the life of thought they know the old image of atheism was an intellectual image but they don't keep up with learning and thinking as professors do. Radford expresses surprise that so many scientists believe in God, even with the old figures that gave atheists such solace. The figure he uses is the outdated 4 in 10. We have to keep in mind atheism is not a rational choice made by thinking machines who feel nothing. It's an emotional choice made by people with low self esteem. They need to put themselves up by putting Christians down. They can't say they hate God, even though they hate themselves and thus they must hate at least the idea of a creator, so the next best thing is to hate those who believe in God. It's very important for them emotionally to believe that they are smarter and that all intelligent people validate their world view. The atheist ideology suggests that science is a priesthood of knowledge and scientists are the only people who know anything. These are not rational analysis based upon empirical data from studies, but articles of faith. Nicely summarized. Do yourself a service and double check your spelling and grammar. There's obviously a higher percentage of people less concerned with religion among scientists than among the general public. Even the scientists who believe in "God," what exactly do they believe about God and what level of devotion and concern about "God" and their "personal salvation" are we talking about? I also don't know any atheists who think such percentages constitute proof of atheism, or even count highly as evidence, though if the entire world's percentages of religious belief more closely resembled that of scientists, I daresay many atheists would be pleased to accept that kind of world rather than the one we presently inhabit. Also note that no one is taking a poll of clergy, people professionally trained to study the activities and words of God in the Bible and in the congregations where such clergymen preach. So perhaps "being a scientist" and the "opinions of scientific experts" now have a generally recognized higher value today than that of clergymen. And isn't that saying a lot in itself? "Also note that no one is taking a poll of clergy, people professionally trained to study the activities and words of God in the Bible and in the congregations where such clergymen preach. So perhaps "being a scientist" and the "opinions of scientific experts" now have a generally recognized higher value today than that of clergymen. And isn't that saying a lot in itself?" No, hate to break it to you, but your non sequitur does not apply. This was pointing out the fact that atheists do not quite have the stranglehold on "science" that they want people to believe. This is a great resource, but I cannot share it with my atheist friends as their poor self esteem will cause them to tear it apart due to the grammatical and spelling errors it contains. Please do correct those so the intellectual barricades of those who consider themselves smarter won't cause them to dismiss the research out of hand because of these errors. I'm sure that hardened atheists will still dismiss the facts here, but we can hope that we don't make it easier by not correcting simple mistakes. Thanks! I'm an atheist, and I shared this link. I've never argued that a majority of scientists don't believe in god, and I've never heard it argued, so I was glad to see this post. I shared it and asked my atheist friends (all 3,000+) to never make the incorrect claim--to only note the accurate claim that religious belief among scientific communities is notable lower than that of the general population. I actually promote to theists that a majority of scientists believe in god, because many theists who talk to me try to claim that evolutionary biologists or cosmologists are anti-god or trying to disprove god with their theories. I wish most of *them* realized that most scientists are theists/deists, so they'd realize that science is not an anti-god conspiracy--an argument I *do* hear considerably often that is nicely debunked by stats like these. Thanks again! There are factual errors as well as the errors of spelling and grammar. 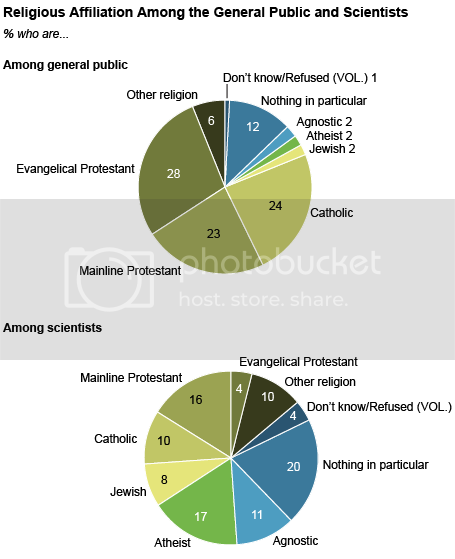 The pie chart at the top (from the Pew study) for scientists shows, when the 'don't know/refused' category removed, shows 48% with some form of religious belief and 48% without. Factually, neither side can claim a majority of scientists. Not that such a point would prove a lot anyway. Similarly, for the Ecklund and Scheitle study, the overall rate of *disbelief* for the 'hard sciences' is 37.6% and for the 'soft sciences' is 31.2%, which doesn't support the claim that "That contradicts the findings of Nature which had most unbelief in hard scineces (physics and biology) and more belief in 'soft' or social sciences." On the contrary, this evidence *supports* the claim in Nature. These are not the only ones. If you're going to make an argument based on statistics, it's essential to avoid these kinds of errors. @Bravus "Similarly, for the Ecklund and Scheitle study, the overall rate of *disbelief* for the 'hard sciences' is 37.6% and for the 'soft sciences' is 31.2%... this evidence *supports* the claim in Nature." Actually, there's not enough information to determine if the Nature claim is supported or not by this data. We need more than mere percentages - we also need standard deviation to determine if the difference shown falls within the margin of error. I followed the link, but hit a pay wall, so I couldn't gather than info for you. I believe you are mistaken in your interpretation of the Religious Affiliation pie chart, though. Since Atheist and Agnostic were specified as options, "Nothing in Particular" would seem to refer to belief in a deity without a specific religious affiliation (from the title). Thus they must be included in the "some form of religious belief" category, and the majority claim is supported by the data at 68%. There seems to be a lot of discussion in certain circles at the moment as to what exactly the "none's" or "Nothing in Particular" signify in these current surveys. Interesting article, for theists and atheists both. I would like to see the questions in those surveys. The agnostic and atheist responses are the only purely unreligious answers, but depending of how the question is formulated, it's not impossible to be in more than one category. For example, Einstein was a proud jew as well as a self proclaimed agnostic. This is possible also among the other religions, one can be culturally a member and participant in a religion without having a belief in the god or gods of said belief. There is also the "other religion" category. There is a number of godless religions that is much more closely related to atheism and agostisism than a theist religion. These are however probably very minor deviations that may not impact the result, but as I said, it would be very interesting to read the questions of the surveys, both from 1914 and from the most recent. Please proofread and correct all the spelling, typographical, grammar, punctuation, and capitalization errors, even if it means reposting and deleting the old version. Please. Otherwise, you did an amazing job at reading and summarizing all these statistics.